Published: Nov. 20, 2008 at 08:38 p.m.
Albert Haynesworth has been unstoppable most of the season; Jets G Alan Faneca looks to at least slow him down this week. 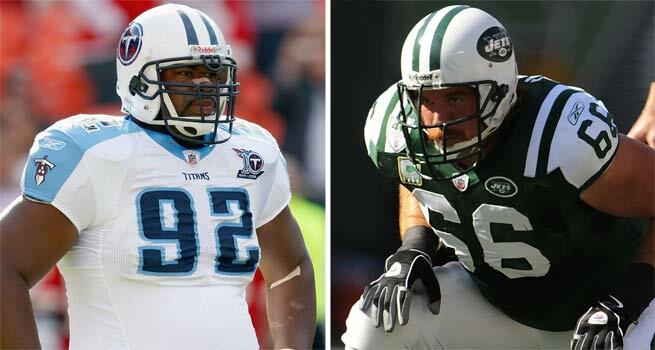 The Jets and Titans square off in Nashville for the second consecutive year. Tennessee had six sacks in a 10-6 win over the Jets last year, a game in whch neither team had 300 yards of total offense. The Jets have 34 sacks and have allowed 19 so far this season. The Titans have 28 sacks and have allowed 6. The Jets are plus-1 in turnover margin; the Titans are plus-10. 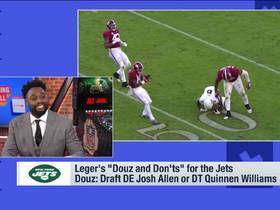 The Jets' defense allows an average of 321 total yards per game; Tennessee allows 282. (Note: There are 11 teams that allow an average of less than 300 yards per game. None has a losing record; the overall record is 76-33-1. This is a matchup between two heavyweights who started in the Pro Bowl last season. Faneca, the Jets' starting left guard, is a big, strong, very physical player with excellent quickness off the ball. He gets into run blocks quickly and can pull with good ability to block on the move. 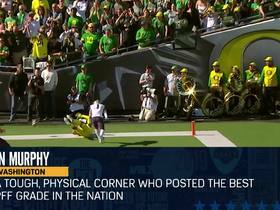 He has good stunt awareness and good vision in pass protection, picking up blitzers. He has pop on short sets in pass protection, and sets the tempo as the best offensive lineman on the Jets. In three career games against the Jets, Haynesworth has recorded 22 tackles, 3 quarterback pressures and 1 sack. He leads the team this season with 7 sacks. Haynesworth is a dominant player with great strength and quickness. He is light on his feet for his size, and plays best in the gap. Another key matchup to watch in this game: Jets QB Brett Favre, age 39, versus Titans QB Kerry Collins, age 35. Both have taken teams to the Super Bowl. Favre has not thrown an interception in his last two games, but the Titans are second in the NFL with 15 INTs. Favre has been sacked only four times in last four games. In his last two games, Collins has thrown 5 TD passes and 1 INT. Many preseason prognosticators had these two teams in the playoffs. The Texans won three of their final four games in '07 to finish 8-8. Cleveland surprised just about everyone with a 10-6 record, missing the playoffs in a tiebreaker. Instead, this shapes up as a matchup of teams trying to salvage something from a disappointing year. This is a marquee matchup between two young and outstanding NFL players. Williams has 22 sacks since the start of last season -- only Jared Allen and DeMarcus Ware have more in that time. Williams is tall, has good speed and long arms. He has outstanding quickness, plays with intensity and can be dominant at times. He will disrupt plays and create turnovers. Last year against Cleveland, Williams had 4 solo tackles, 1 sack, and 1 forced fumble. Thomas is a second-year player who started every game and played every snap in his rookie season. He was named Rookie of the Month for November -- the month Cleveland played Houston. He started in the Pro Bowl, something very few rookies do -- especially rookie left tackles. Thomas has long arms, very good feet, and strong hands -- that part is important for an offensive lineman, because it's a big thing to get his hands on the defensive lineman and lock him up. Another key matchup to watch in this game: Texans RT Eric Winston, a third-year player who is very good, vs. Browns LB Willie McGinest, a 15-year veteran who is having a very good year. In last year's meeting, McGinest played a big part in limiting the Texans to 77 rushing yards. Manning and Warner do have a few things in common -- both are Super Bowl MVPs and leading candidates for MVP of the 2008 season. On the other hand, Manning was a four-year starter at a major college program who became the first overall player drafted; Warner spent much of his time at tiny Northern Iowa as a backup, and he went undrafted in the NFL. Now, both quarterbacks are leading high-powered offenses. The Giants, perhaps surprisingly, lead the NFL with 292 points scored. The Cardinals are tied for second overall with 289 points. Both teams have exceeded preseason expectations. Arizona has a four-game lead in the NFC West and can clinch the division this weekend with a win and losses by the 49ers and Seahawks. Warner is a pocket passer with three outstanding receivers. He has passed for more than 300 yards in four consecutive games, which is a Cardinals team record. He's on pace to pass for more than 5,000 yards for the season. He is very accurate, completing over 65 percent of his passes -- second all-time behind Chad Pennington. His completion percentage is over 70 percent this season. Warner is one of the great success stories in NFL history. He's very good at running the no-huddle offense, which is very important, because it prevents the defense from being able to substitute. In five career games versus the Giants, he's passed for 1,507 yards. After nine games in 2004, Manning replaced Warner as the Giants' starter -- and he has started 65 consecutive games since. Manning's 2008 stats are not as gaudy as Warner's, mainly because the team philosophy is to run the ball. He has outstanding ability to adjust to changing situations on the field. He has better athletic ability than you think, and possesses the arm strength needed for the windy conditions of Giants Stadium. Manning seems to improve every game and makes a lot of clutch throws. Another key matchup to watch in this game: Giants DE Justin Tuck, who leads the team with 8.5 sacks, versus Cardinals RT Levi Brown. Most likely, the playoffs will be out of the question for the loser of this game. The Colts would still have an outside shot if they lose this game to the Chargers, based on an easier remaining schedule. But there's a lot of pressure in this game on two teams that were expected to win their division. This is the second year in a row these teams are meeting in San Diego, and I don't think anyone who witnessed last year's game could believe just what they saw. Chargers' backup RB Darren Sproles had three TDs in the first quarter -- including one on a punt return and one on a kickoff return. Manning threw six interceptions. And after all that, the Colts were in position to win the game -- only to watch clutch kicker Adam Vinatieri miss a 24-yard field goal try with 1:34 left to play. In this meeting, Rivers is coming off his worst game of the year last weekend in Pittsburgh. He faced lots of pressure against the Steelers, but when you allow him to get comfortable, he is very good. He has completed 67 percent of his passes this year and leads the NFL in TD passes with 21. He also leads the AFC with a passer rating of 100.8. He has the ability to move side to side, but doesn't like to run. In 20 career home starts in the regular season, his record is 18-2. Manning is very smart, adjusting quickly to new looks that defenses throw at him. Edge pressure does not affect him at all -- he just moves up in pocket, Inside pressure forces him to get rid of the ball quicker. After a slow start, Manning seems to be back on track -- he's thrown 7 TDs and no interceptions in his last three games. Manning is amazingly accurate with the football. He can put it on the right spot 90 percent of the time. Another key matchup to watch in this game: Reggie Wayne, who is the Colts leading receiver and is on pace to catch 91 passes, versus Chargers CB Antonio Cromartie, who had three of those six picks vs. Manning in last year's game. It's very hard to throw the ball over Cromartie.